Although I understand and think that the effects of amnesia can be quite difficult to understand, in my opinion, Naomi Porter was just too difficult to read about. I’m not sure when I started taking a disliking to her, but I’m pretty sure it was after she thought every single person was being annoying—whether it was her mother who went to visit her in the hospital or getting irritated with her dad for trying to help her see what she’d forgotten. But still. I figured that I should give Naomi the benefit of the doubt. She’s woken up muddled and confused, so it’s obvious that she should not be judged so harshly. But when it wasn’t Naomi that was annoying, it was either Will, Ace, or James. The three most irritating people that I’ve ever had to read about. God. What Naomi sees in them, we will never know. Although she tries to explain, I just couldn’t see it. Will was far too whiny and just plain insensitive to the fact that Naomi had obviously suffered amnesia. Ace just knocked on her window at night and then proceeded to kiss her and immediately used the most BS metaphor I’ve ever had to read about how they slept together for the first time. James was just too moody, and in my opinion Naomi let him treat her terribly! I mean, if my boyfriend made me wait for him so long that a couple walking by thought that I was effing homeless then I would so pissed off! remembers everything in her car towards the end of the book. I guess the only thing that made me happy about that was that we were shown another month of her life after that! One thing that I did appreciate about this is that Naomi has changed overall as a character, and we get to see what parts of her she had to rediscover and how that affected her. I appreciated Naomi more towards the end when I looked past her being whiny for everything. Also, I like the fact that there was more than one love interest just to show that she didn’t need to rely on one person and that you do end up falling in love more than once. 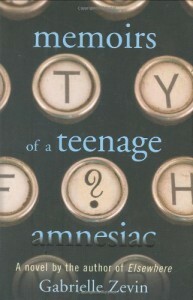 Overall, I would recommend reading Memoirs of a Teenage Amnesiac if you’re in the mood for something different and just want to try it out.